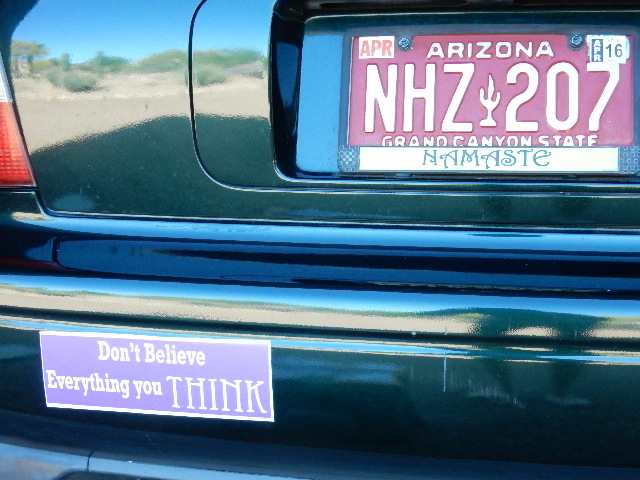 My bumper sticker reads Don’t Believe Everything You Think. The internet attributes the words to lyrics in a Lee Brice song. Anyway, an old car in Bozeman, MT had those words stickered on the rear bumper. I was on my way to Yellowstone, and those words rang true for me. Let go of negative thoughts. Stop being judgmental and stop second-guessing. A woman in a Sam’s Club parking lot read the sticker and commented to her friend, “Jimmy should read that. It’s one frickin’ good sticker.” If only those words had reached George Bush before he attacked Iraq. my heart smiles to your message!